You may have noticed that I’ve been rather silent over the last 2 weeks…no blogging, little social media interaction, and (startlingly) very few e-mails sent. My wife and I spent the last 2 weeks in China with a group of folk from a non-profit organization where we volunteer. Since I also sit on their board of directors, when they first discussed a trip to China…we were onboard. There is something to be said for using frequent flyer miles for an overseas trip. 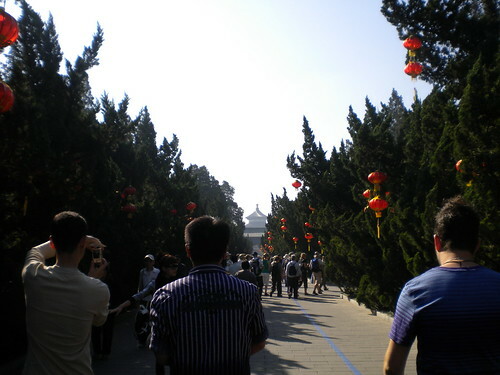 We spent the first few days in Qinhuangdao and the balance of our time in Beijing area. The trip coincided with the celebration of the 60th anniversary of China and, as a result we were able to see the fireworks and spend the next day in Tianamen square with 1M of our closest friends. Although we returned late last week, I’m just now at the point where I’ve dug out from backlogged reading and e-mails. 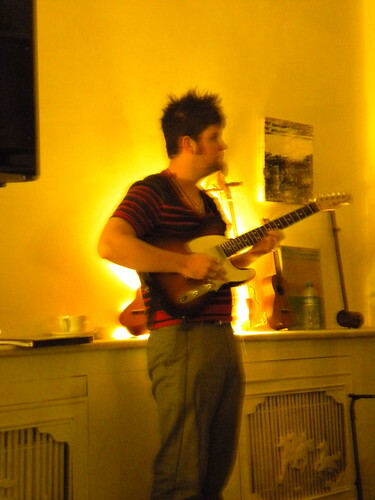 If you are a friend of mine on Facebook you will have seen these photos. For those of you who haven’t connected (please do), I’ve put a few photos…of the several hundred we took…after the jump. 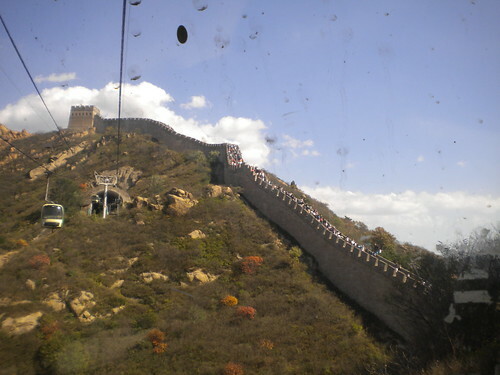 Due to the holiday, we went to the Great Wall on October 1. Evidently there were several Chinese nationals who felt similarly as it was quite crowded. A lovely day though, and a beautiful experience. 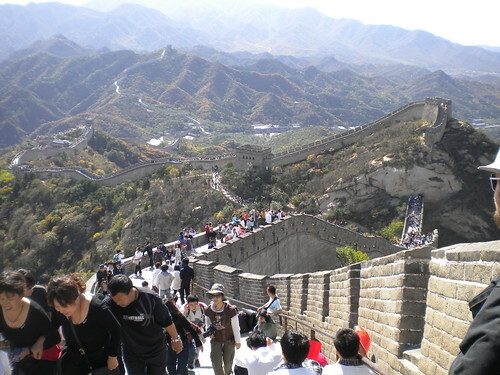 It is steep, painfully steep, to climb the Great Wall. And, as our guide reminded us frequently, however far you walk is the distance you have to return to catch the gondola down the mountain. 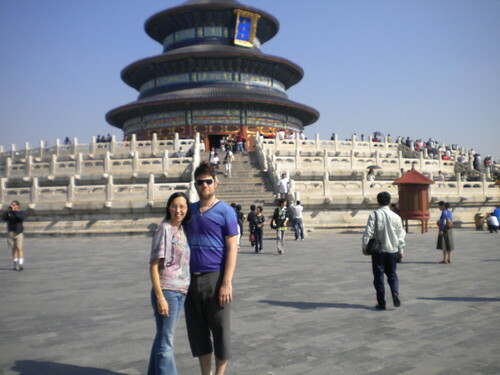 Just around the corner from our hotel is the Temple of Heaven. Stunningly beautiful gardens, amazing architecture dedicated to a combination of Taoist worship and pre-Taoist heaven worship. Surprisingly tranquil in the midst of an otherwise bustling city. One of the interesting parts of the trip was the opportunity to pursue passions that lie outside those of payments and technology. In addition to playing at several coffee shops (such as the one pictured) and an art gallery, I was given the chance to discuss art interpretation with Chinese University students (both general studies and fine arts). Sometimes the translation of Chinese statements to English were quite humorous. 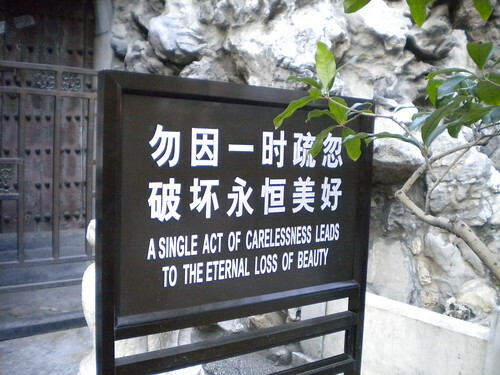 This sign, located in the Forbidden City, however was the opposite. The prose here is much more stunning than Please Don’t Litter. Quite the trip…and quite the backlog of interesting things that transpired in the word of payments and technology over the last few weeks. Comments and analysis of those items will be forthcoming as, alluded to above, I am now (largely) caught-up.